Facility Design | UrbanOre.com - Facility Design - The best disposal sequence is: reuse first, recycling second, then regulated materials, and composting options at the end. Frustrated with the city of Berkeley's progress on updating their outmoded solid waste transfer station, in 2007 Urban Ore hired and paid architects Mark Gorrell and Greg VanMechelen to create this modern facility design. 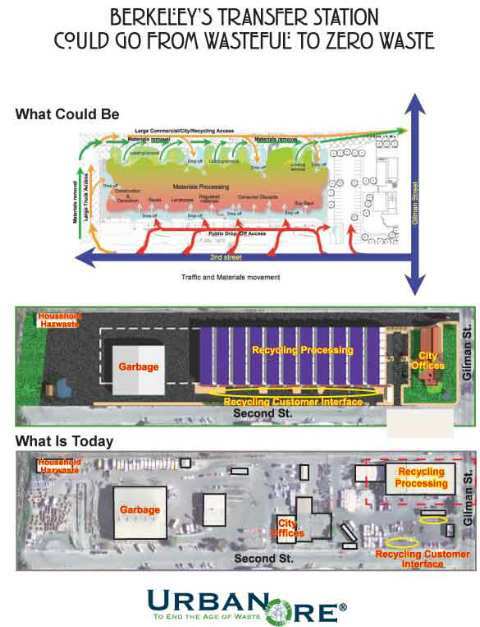 In 2005 the City of Berkeley’s consultant, Environmental Science Associates, recommended redesigning its outmoded solid waste transfer station. The facility opened in 1983 and had become dilapidated, and also the transfer station couldn’t achieve the City’s policy goal of recovering 75% of the discards. Today in 2010 the City’s policy aims above 75% to Zero Waste, but the transfer station remains the same. No Requests for Proposal have been issued to rebuild it. Frustrated, in 2007 Urban Ore hired and paid architects Mark Gorrell – one of the most experienced Zero Waste designers in the world – and Greg VanMechelen, an experienced solar architect with excellent local projects under his belt. The two had worked together designing Urban Ore’s Ecopark, converting a heavy manufacturing building to mercantile use. 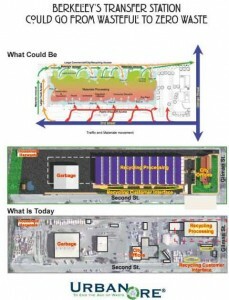 They did a schematic redesign of Berkeley’s transfer station. Urban Ore donated the redesign to the City in 2007. As of September 2010, the City hasn’t moved on Urban Ore’s design and still hasn’t asked for anyone else to do another one. An online tour using a voice-over PowerPoint show or QuickTime movie may soon be available. Within a purpose-built zero waste facility, commodities are clustered into four distinct areas: reuse, recycling, regulated materials, and composting. Each area should have its own specialized receiving, processing, and exporting trade practices. Many zero waste facilities are not on the same site, but clustered around a central function, such as wasting. In this case, individual zero waste facilities compete with wasting facilities for the same supply of materials. Reusables have high present value, and should come first in the unloading sequence. Paper, polymers, metals, glass, textiles are the main recyclables. Chemicals, oil, televisions, electronics, and paints are the main regulated materials. Compostables include plant debris, putrescibles, wood, soils, and ceramics. Let us help you make a better design – Consult with us on your next Zero Waste Facility Design project.